Strategic technology trends have significant disruptive potential over the next five years. These are the top ten trends that CIOs cannot afford to ignore, according to global research consultancy, Gartner. The top ten technology trends - not to be confused with the annual Gartner predictions - outline the emerging strategic technologies that Gartner recommends CIOs should be focussed on in 2018. The top trends for 2018 underpin the digital platform and set the stage for business innovation. Companies need to examine their business impacts and adjust business models and operations appropriately or risk losing competitive advantage to those who do, says Gartner. 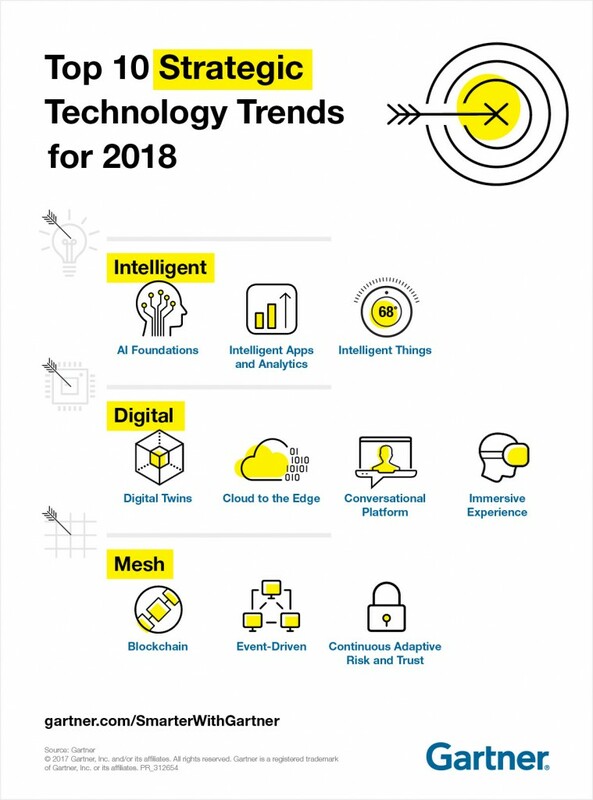 For the second consecutive year, Gartner has grouped its top ten tech trends under the three headings - Intelligent, Digital and Mesh. Intelligent: How AI is seeping into virtually every technology and with a defined, well-scoped focus can allow more dynamic, flexible and potentially autonomous systems. 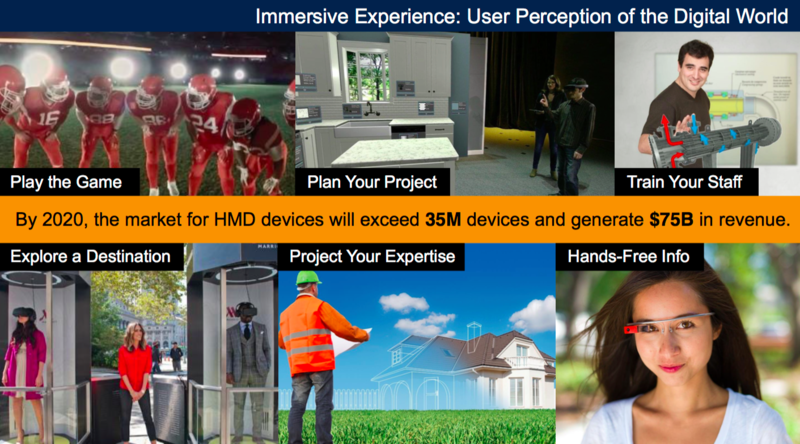 Digital: Blending the virtual and real worlds to create an immersive digitally enhanced and connected environment. Mesh: The connections between an expanding set of people, business, devices, content and services to deliver digital outcomes. 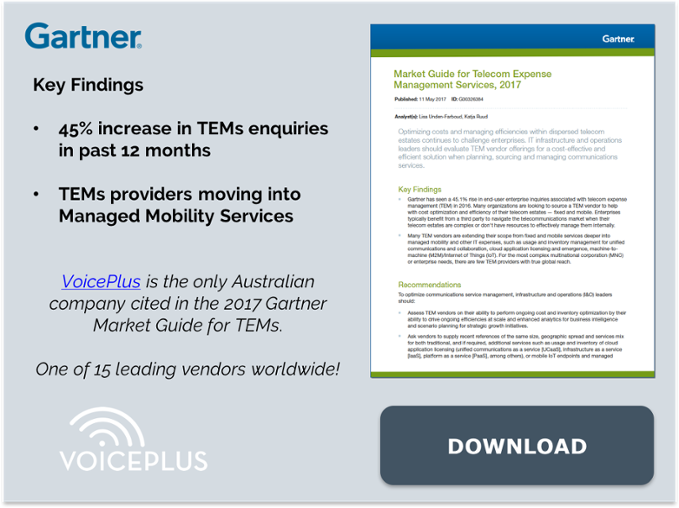 Gartner Reserach VP, Brian Burke, outlined the top ten trends at Gartner Symposium 2017 in the Gold Coast, 30 October-2 November. A recent Gartner survey showed that 59% of organisations are still gathering information to build their AI strategies, while the remainder have already made progress in piloting or adopting AI solutions. Although using AI correctly will result in a big digital business payoff, the promise (and pitfalls) of general AI where systems magically perform any intellectual task that a human can do and dynamically learn much as humans do is speculative at best. Narrow AI, consisting of highly scoped machine-learning solutions that target a specific task (such as understanding language or driving a vehicle in a controlled environment) with algorithms chosen that are optimized for that task, is where the action is today. “Enterprises should focus on business results enabled by applications that exploit narrow AI technologies and leave general AI to the researchers and science fiction writers. 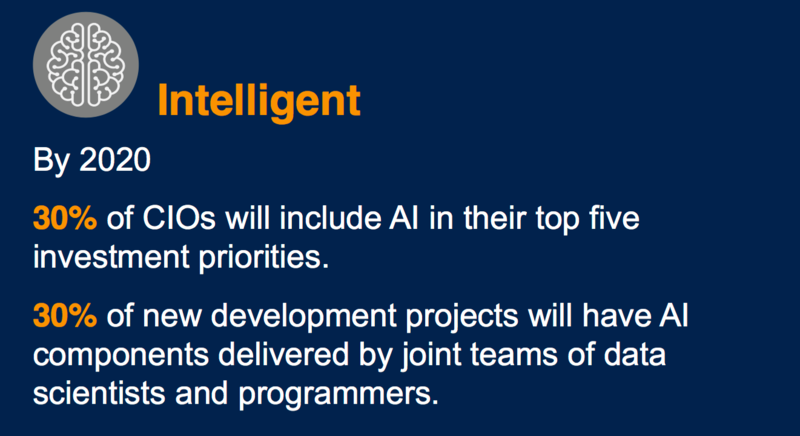 Over the next few years every app, application and service will incorporate AI at some level. AI will run unobtrusively in the background of many familiar application categories while giving rise to entirely new ones. Augmented analytics is a particularly strategic growing area that uses machine learning for automating data preparation, insight discovery and insight sharing for a broad range of business users, operational workers and citizen data scientists. 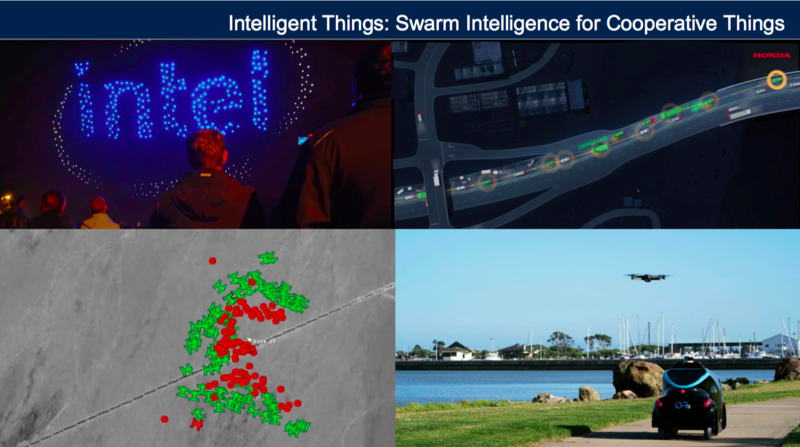 As intelligent things proliferate, expect a shift from stand-alone intelligent things to a swarm of collaborative intelligent things. 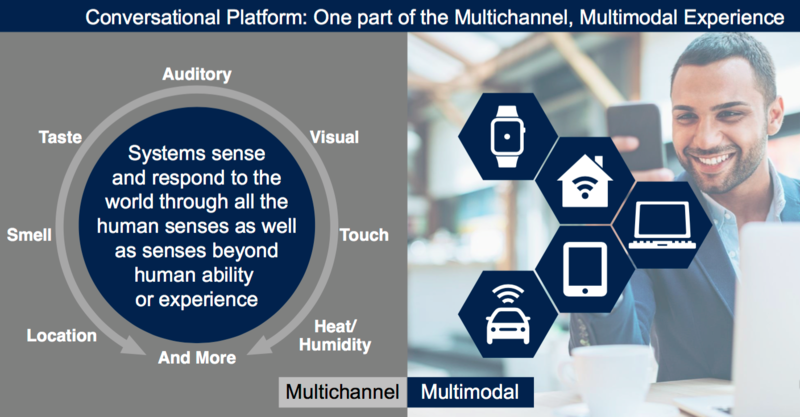 In this model, multiple devices will work together, either independently or with human input. The leading edge of this area is being used by the military, which is studying the use of drone swarms to attack or defend military targets. This technology will be applied to consumer things most noticeably autonomous vehicles. A digital twin is a digital representation of a real-world entity or system. 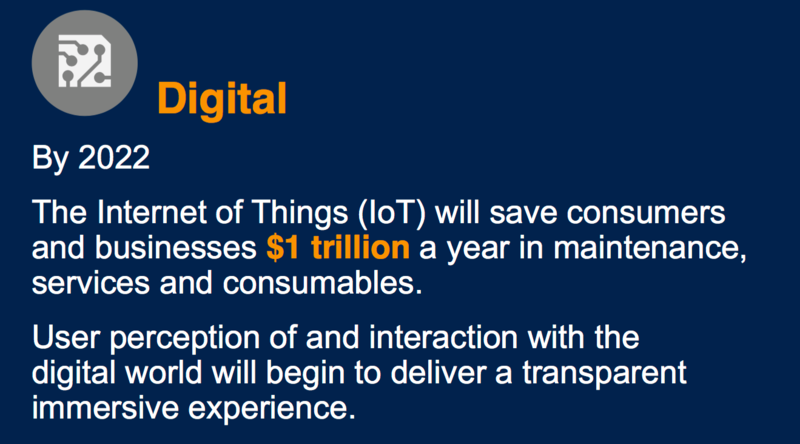 In the context of IoT, digital twins are linked to real-world objects and offer information on the state of the counterparts, respond to changes, improve operations and add value. While it’s common to assume that cloud and edge computing are competing approaches, it’s a fundamental misunderstanding of the concepts. Edge computing speaks to a computing topology that places content, computing and processing closer to the user/things or “edge” of the networking. Cloud is a system where technology services are delivered using internet technologies, but it does not dictate centralized or decentralized service delivering services. When implemented together, cloud is used to create the service-oriented model and edge computing offers a delivery style that allows for executions of disconnected aspects of cloud service. The conversational platform will turn the interaction model on its head. Whereas humans have had to learn and adapt to technology, conversational platforms will have machines learn and adapt to human behaviour. 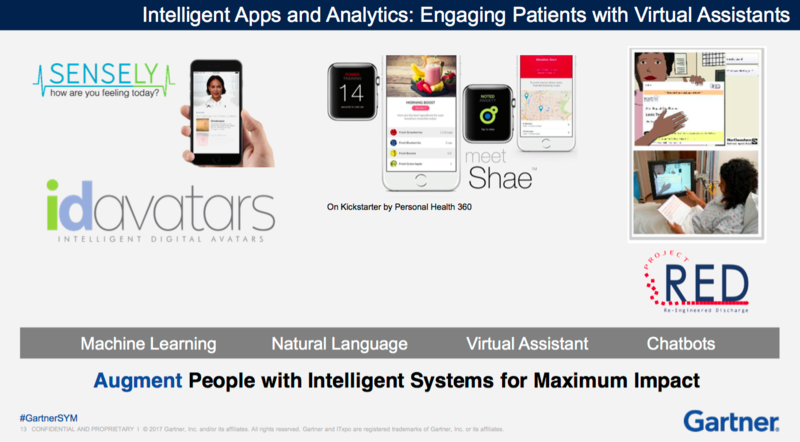 Already these systems are capable of simple answers, such as asking Siri 'How’s the weather? ', but will extend to more complicated interactions like booking a reservation at the Italian restaurant on Parker Ave. These platforms will continue to evolve to even more complex actions, says Gartner, such as collecting oral testimony from crime witnesses and acting on that information by creating a sketch of the suspect’s face based on the testimony. Augmented reality (AR), virtual reality (VR) and mixed reality are changing the way that people perceive and interact with the digital world. Combined with conversational platforms, a fundamental shift in the user experience to an invisible and immersive experience will emerge. Application vendors, system software vendors and development platform vendors will all compete to deliver this model. Over the next five years the focus will be on mixed reality, which is emerging as the immersive experience of choice, where the user interacts with digital and real-world objects while maintaining a presence in the physical world. Blockchain is a shared, distributed, decentralized and tokenized ledger that removes business friction by being independent of individual applications or participants. It allows untrusted parties to exchange commercial transactions. 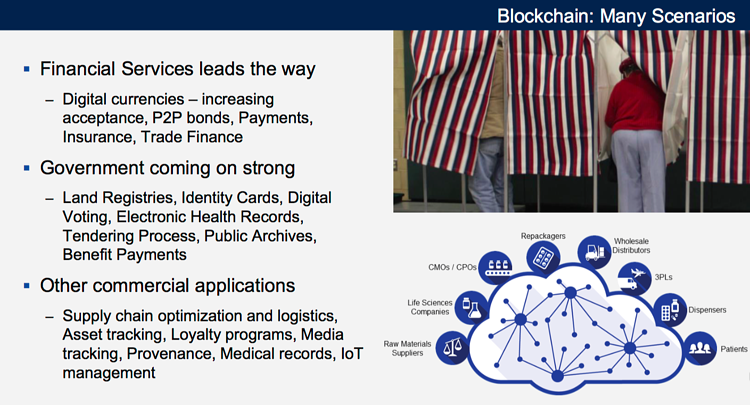 The technology holds the promise to change industries, and although the conversation often surrounds financial opportunities, blockchain has many potential applications in government, healthcare, content distribution, supply chain and more. However, many blockchain technologies are immature and unproven, and are largely unregulated. With the advent of AI, the IoT, and other technologies, business events can be detected more quickly and analysed in greater detail. 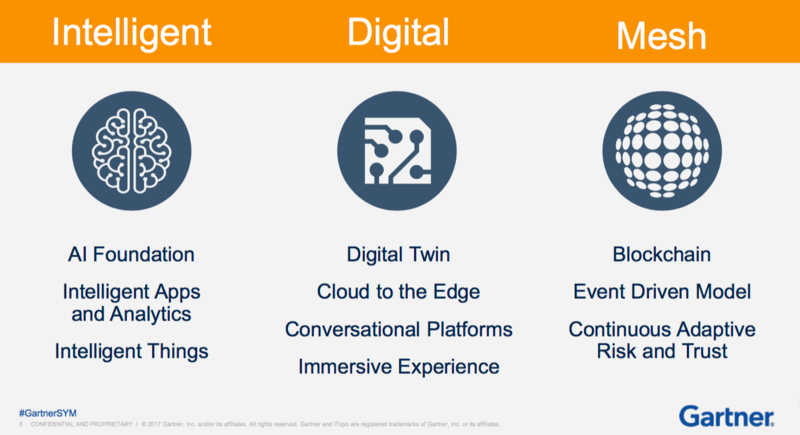 Enterprises should embrace “event thinking” as part of a digital business strategy. By 2020, event-sourced, real-time situational awareness will be a required characteristic for 80% of digital business solutions, and 80% of new business ecosystems will require support for event processing. 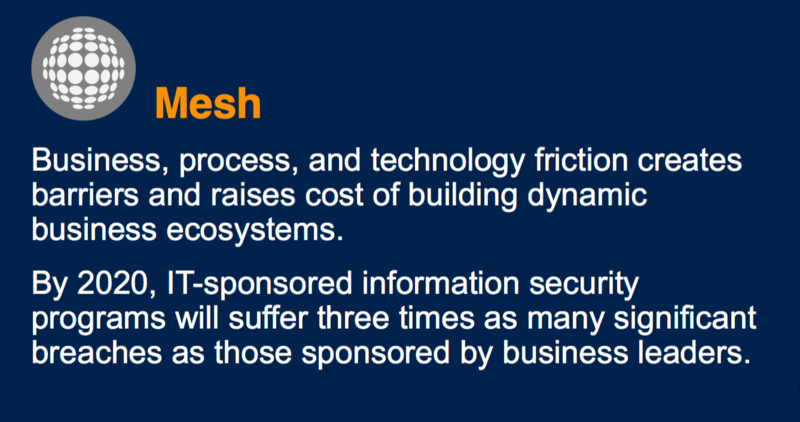 Digital business creates a complex, evolving security environment. The use of increasingly sophisticated tools increases the threat potential. Continuous adaptive risk and trust assessment (CARTA) allows for real-time, risk and trust-based decision making with adaptive responses to security-enable digital business. Traditional security techniques using ownership and control rather than trust will not work in the digital world.